You must make reservations at least 5 minutes in advance of the time at Sticky Rice - Baltimore. Order catering pans of any noodle dishes or your favorite sushi. Can accommodate large orders with sufficient notice. With its charming atmosphere and bad attitude you won"t find anything quite like it. 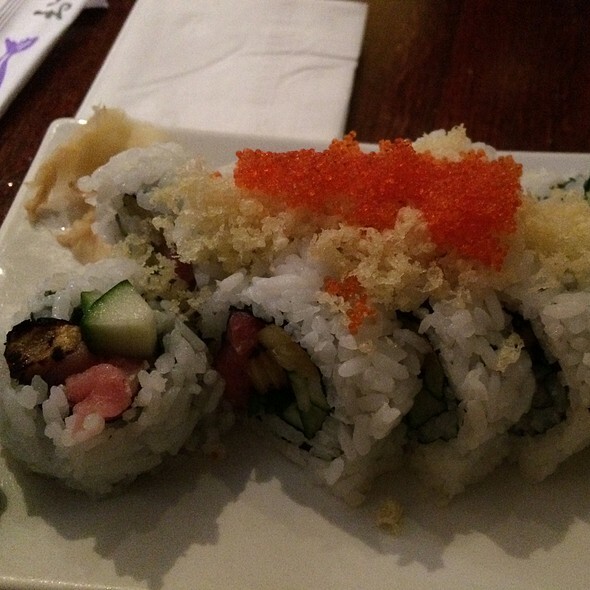 Our specialty is our fresh sushi bar. With rolls like g.i.jane, shiitake happens and Godzirra, how could you go wrong? 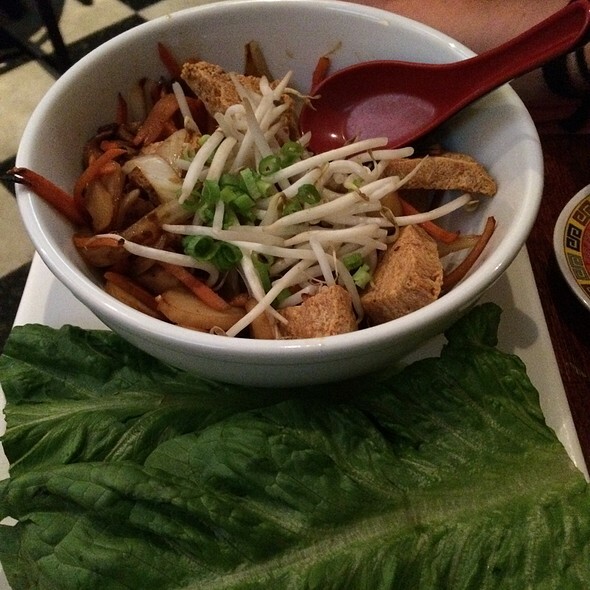 Our huge bowls of noodles will satisfy big and small. Sandwiches, large salads, and a selection of other entrees round out the menu. We also feature a kids menu! 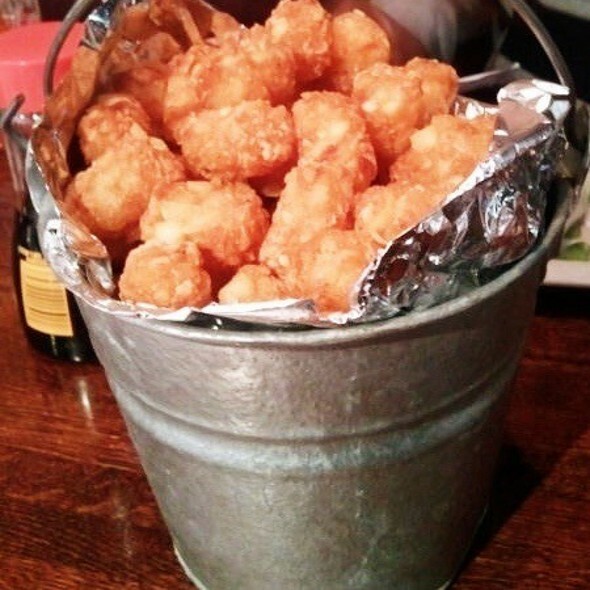 Don"t forget the (soon to be famous) bucket of tater tots with our special tot sauce. Sticky Rice, established last century has been rolling on and on. Sticky Rice serves up an unusual mix of American, Pan-Asian entrees in a friendly, inexpensive and inviting atmosphere. Spring rolls, potstickers, sushi, noodles and edamame (steamed soy beans) are simple and standard. Lots of choices for vegans and vegetarians! Tofu stir-fried with water chestnuts, broccoli, onions and carrots. Tender bite-sized flash fried pieces of onion-garlic battered tofu served with a sweet potato, brown sugar and dashi puree. Pork ribs coated in a five-spice rub and teriyaki glaze served over mixed greens. Seaweed salad tossed in a sweet soy sauce garnished with sesame seeds. Onion, curry, garlic buttermilk battered fried chicken bites drizzled with a sweet soy sauce garnished with pickled sweet onion. Pan seared tuna bites rolled in sesame topped with wasabi aioli and teriyaki sauce. Large bucket of tater tots with our award winning secret tater tot sauce!! Large bucket of sweet potato tots with honey ranch dressing. 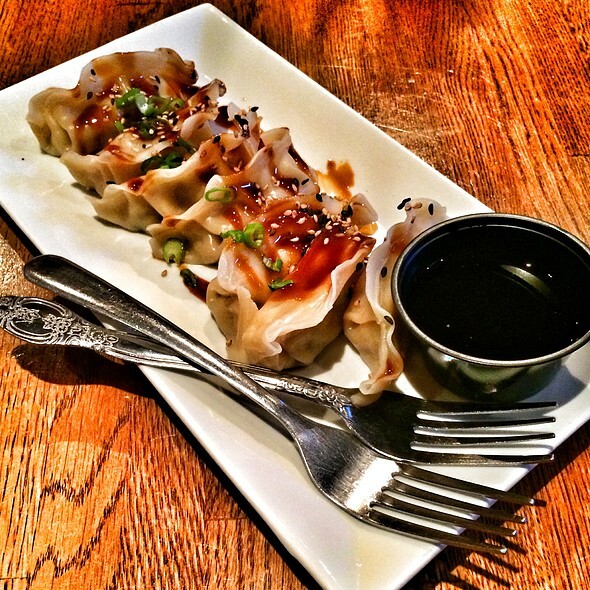 Steamed or fried chicken dumplings with spicy soy dipping sauce. Deliciously fresh and never fried. Thai basil, carrots, cucmber, red peppers, mint and rice noodles wrapped in rice paper. Crispy wedges of tofu tossed in teriyaki sauce with sesame seeds and scallions. Tuna, yellowtail, salmon, rockfish, shrimp and tamago. Tuna, yellowtail, salmon, rockfish, shrimp and tamago (two pieces each). Tempura shrimp with avocado, cucumber, tobiko and spicy sauce. 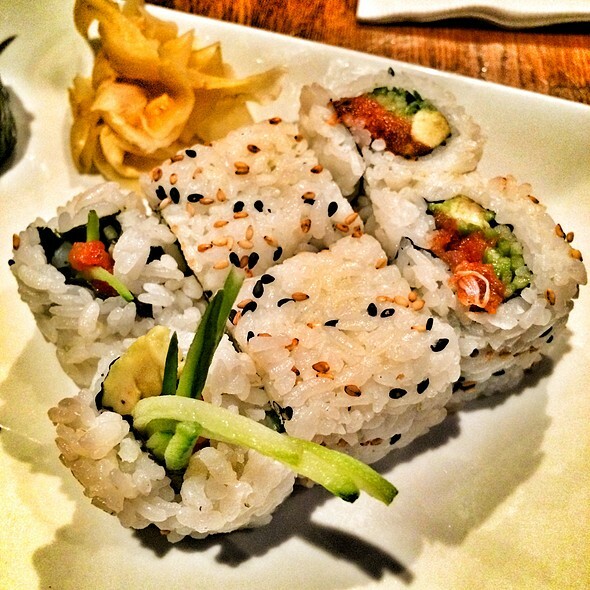 An inside-out roll with smoked salmon, cream cheese, scallions and avocado. Red pepper, cilantro, and spicy rice stuffed in an inari pocket then tempura fried and drizzled with eel sauce. Gobo, oshinko, shiba zuke, blanched asparagus, and cucumber rolled inside-out with sesame seeds (10 pieces). Spicy marinated tofu with scallions, peanuts, cucumbers and carrots. Tempura carrots, cucumbers, avocado, rolled with wasabi mayo and umeboshi paste. A real spicy garden of eden! 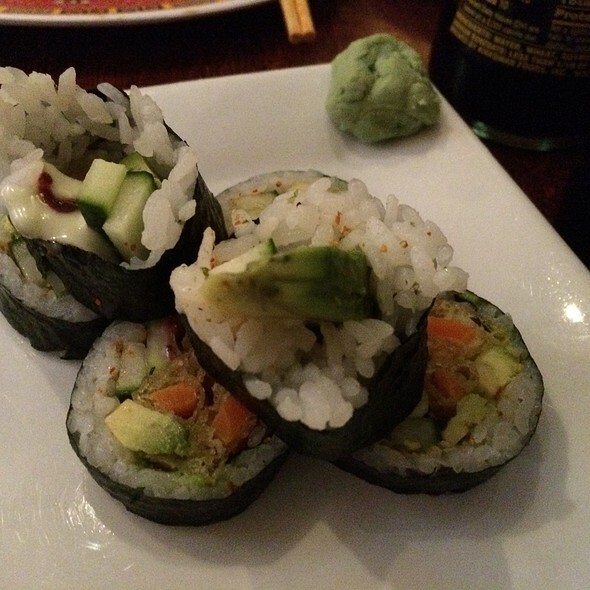 Cucumbers, avocado, cream cheese, scallions and sesame seeds rolled in crushed wasabi peas. Tempura fried sweet potato with sam bahl and sesame seeds. Tempura fried sweet potato with agave jalapeno and sesame seeds. Tempura fried sweet potato drizzled with honey. Oshinko, asparagus, agave, and vegan cream cheese in a mini tempura fried maki roll; rewrapped and topped with vegan spicy mayo. Smoked salmon, cream cheese, avocado, spicy sauce drizzled with eel sauce and scallions. Lump crab meat, smoked salmon, eel and cream cheese drizzled with sriracha. Cream cheese or vegan tofutti with cucumbers, avocado, spicy sauce or vegan spicy sauce and drizzled with ponzu and scallions. Large crunchy shrimp, avocado, cream cheese, spicy sauce, and cucumbers with tempura crunchies and tobiko. 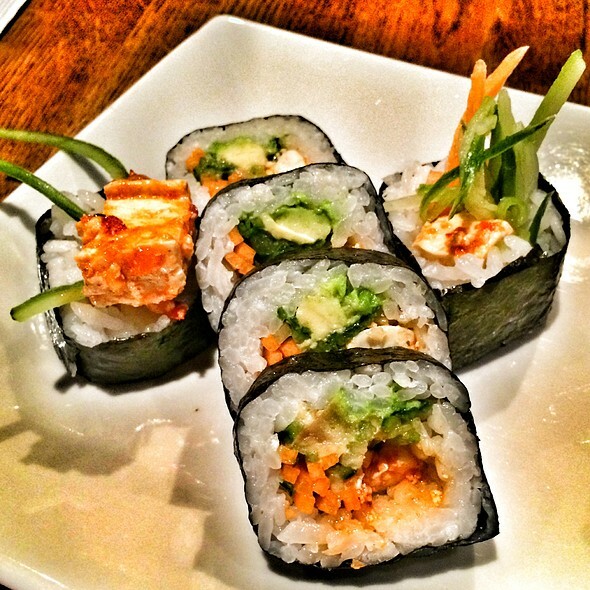 Tuna, cilantro, cucumber, jalapeno and grilled pineapple with tempura crunchies and tobiko. Crunchy shrimp with lump crab meat and cucumber served with garlic butter. 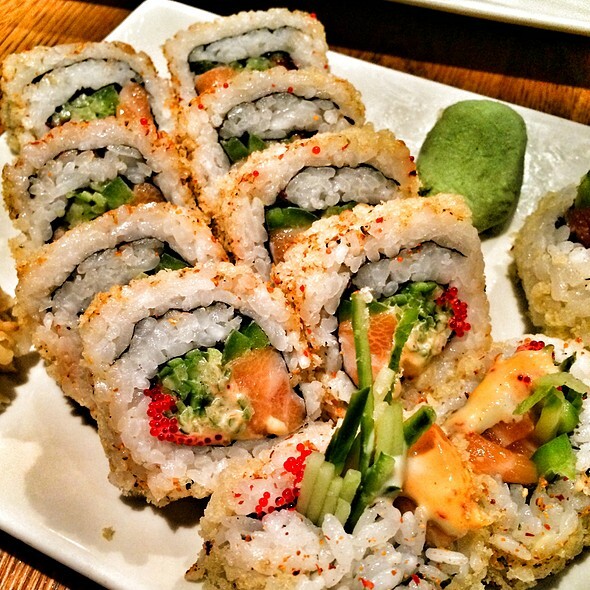 A large spicy roll with fresh salmon, cucumbers, jalapenos, tobiko and tempura crunchies. A japanese phrase for "i'll leave it to you!" Our chef will prepare you you an assortment of nigiri, sashimi, and maki (for two). Tuna, lump crab meat, and sriracha rice in an inari pocket tempura fried topped with scallions, wasabi dressing and eel sauce (two balls!). Old bay rice, lump crab meat and maryland sweet corn stuffed in an inari pocket tempura fried and topped with an old bay mayo and eel sauce (two balls!). Big eye tuna, cucumber and avocado topped with seared spicy tuna, spicy eel sauce, tobiko and tempura crunchies. Yellowtail, cream cheese and scallions rolled in crushed wasabi peas. Smoked salmon, goat cheese and scallions. Tempura fried jalapenos stuffed with spicy salmon and cream cheese topped with ponzu, eel sauce, and green onion (4 pieces). Rice paper wrapped tempura shrimp with spicy tuna, avocado, jalapeno, green onion and sushi rice served with a side of creamy ponzu sauce. Diced hamachi chunks dressed in basil oil, sesame seeds and green onions with a touch of salt. Tuna and rockfish topped with ginger-garlic and ponzu flash seared with sesame oil then finished with scallions and sesame seeds. Tender cuts of premium tuna seasoned with sesame oil, ginger-garlic, scallions, togarashi and soy sauce served with wonton chips. Your choice of protein with onions, carrots, snow peas, broccoli and napa cabbage tossed in a house made teriyaki sauce topped with sesame seeds. Chicken and shrimp with red peppers, green peppers and onions tossed in rice noodles dusted with yellow curry. 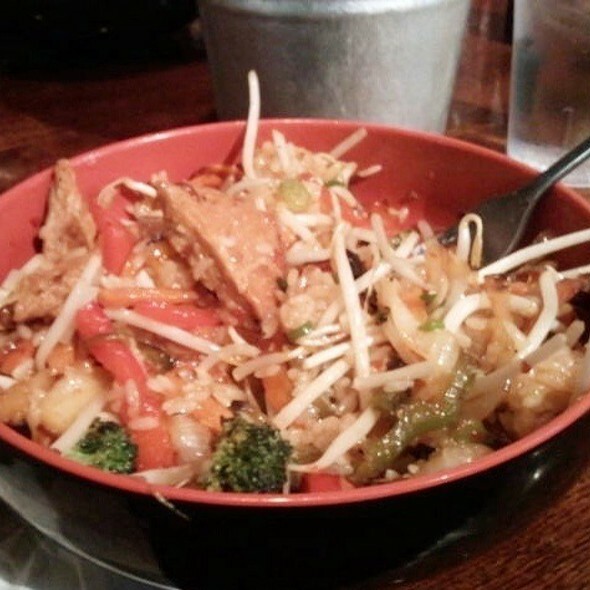 Tofu with your choice of noodles tossed in a house made peanut cocounut sauce and mixed vegetables. Sauteed shrimp and vegatables in a cocunut pepper sauce finished with cucumbers, crushed peanuts, and toasted coconut (slightly spicy). Crispy mock chicken stir-fried with carrots, onions, broccoli, peppers and pineapple chunks tossed in a spicy szechaun sauce over rice. Sliced marinated beef sitr-fried with broccoli, snow peas, onions, water chestnuts, carrots and napa cabbage in a spicy brown sauce. Rice with fresh vegetables and egg sauteed together in a sweet and spicy curry sauce. Sauteed teriyaki vegetables with tofu topped with crushed peanuts with your choice of noodles. Tempura fried shrimp stir-fried with carrots, onions, broccoli, and water chestnuts tossed in a szechuan sauce served with sticky rice. Broccoli, asparagus and spinach served with rice noodles in a large bowl of miso soup. Orange soy marinated grilled salmon on a bed of spinach with carrots, avocado, blanched asparagus, served with orange ginger vinaigrette dressing on the side. Mixed greens with oshinko, cucumbers, carrots and tomato tossed in a house made shitake sesame vinaigrette accented with a house made teriyaki. Sauteed butterflied shrimp over mixed greens, tomatoes, carrots, red peppers and toasted almonds with lime wasabi vinaigrette. Dressing options: orange-ginger vinaigrette, honey ranch, blue cheese and lime wasabi vinaigrette. All sandwiches served with tater tots. Sub any side for $1. Maryland style crab cake with japanese spices, scallions and old bay mayo with a light old bay dusting. Grilled chicken breast marinated in our house teriyaki sauce with miso butter, nori, mixed greens and roasted garlic kewpie. Flame broiled teriyaki glazed burger cooked to order topped with lettuce, tomato and onion with wasabi aioli. Specialty 100% vegan cocktails created by ginny lawhorn for sticky rice baltimore. Breaker bourbon whisky blended with gabriel boudier ginger liqueur and a bit of yellow chartreuse served on the rocks garnished with candied ginger. Same as above served as a gingerale highball. Sailor jerry spiced rum in a sparkling organic limeade with a ouch of yuzu juice. Blue ice american potato vodka in gosling's ginger beer topped with lime-basil macerated orangic strawberries. Edinburgh gin served in pineapple juice and soda water with fresh crushed cucumber and thai basil. Milagro silver tequila with a bit of jalapeno-infused blue agave and patron citronge served in stirring's organic margarita mix. St. Elder elderflower liqueur and veev acai berry liqueur in white cranberry juice and soda water topped with a blend of organic strawberries and navel oranges. Beer + sake + gong = awesome!!! The sushi was great. Overall I really enjoyed it. I will definitely be back! 100% hands down my favorite place to eat in the city. I will meet anyone there anytime. The food was very good. Awesome vegan options! Great place to enjoy a birthday celebration. Service and atmosphere we're top notch. The sweet potatoes tots were fantastic the noodle bowls were nothing to write home about. Would go back but would stick with appetizers and cocktails. A lot of great vegan/vegetarian/plant-based options. All delicious. Really great poki. The Bawlmerr balls my friend are were also excellent according to her. Ambience sort of pub casual. Great food. Many options. Great service on a Sunday evening. Amazing vegan/vegetarian options loved the sushi and gyoza! Menu has a ton of options which is great- but it took forever for a very simple roll and one of the bowls. The roll was cold by the time it came but the bowl was very tasty. Server was pleasant and it was not too crowded- this is why we expected our food to come much quicker. Overall a great place, just a little disappointed this trip! This was THE most amazing meal I have ever gotten to eat. So good, were coming back tonight. 2 days later. The vegan options are amazing. Well thought out and way easy to pick out on the menu. Try the veganzira even if you aren't vegan. It's amazing. This is the new place for us. The food was good. Reasonably priced. The main thing that brought the score down was the fact that every time my party needed something, we had to find our server. That affected the tip that was given. The food was awful with limited options. Service was great! I've been to Sticky Rice before and I plan on coming back. I got the sushi burrito and we had the Mongolian Beef rice bowl (I think that's what it was called). Anyway, everything was great, drinks were always filled. Very nice. Bar drinks a little too strong. This was a hit on our brief trip to Baltimore. Easy, inexpensive and lots of food. Good for a dress down night when you just want to chill and eat good noodle or rice dishes. Interesting, broad menu with Asian flair. Lots of vegan options too. Hard to get a drink. Forgot my soup. Great tater tots and noodles though so maybe I'll try it again someday. Was a good dinner. Overall very solid, but nothing mind blowing. Will definitely go again for something more casual. Not really a special date night place. I always love coming here but the service is always pretty bad. The staff is nice but it seems like they are always hella understaffed on busy nights. That and it always takes a ridiculous amount of time for the sushi to come out. But the food is delicious and I always have a good time. The place wasn’t busy and we were seated right away. The service was great. They were around when we needed something which was great.the food was great and I enjoyed being able to eat vegan while my fiancée enjoyed meat dishes. We will definitely be back! It was just ok. They sat us near the door so we were frozen the entire meal. Potstickers were delicious but my bowl was mediocre...the tempura shrimp got super soggy in the sauce resulting in unappetizing shrimp. My husband said his sushi was rather bland. Kind of a bummer meal. The food was amazing. Bawlmer Balls were out of this world!! Came for Valentine's Day. Made an early reservation, plenty of space. Service was alright, not particularly great. There were tons of Postmates, Grubhub, Ubereats drivers coming in and out, and sometimes the front of the house staff had to pay attention to them instead of seated customers. Food is always very good, and they have tons of vegan, veg, and gluten free options. Cocktails are great, but a little pricey. The miso broth vegetable bowl dish we got wasn't particularly flavorful, but as always the sushi is top notch. Needed a place in Baltimore that was vegan & meat eater friendly. Their menu is huge, everything is clearly labeled. It was raining out so we got $1 PBRs. Extremely cold inside -- there was no one in the restaurant and they still sat us by the front door. Great for dates or big dinners with friends! The food is always good here. The service is consistently good. We absolutely loved the vegan pot stickers and sushi. We sat outside and it was a great date night. Love Sticky Rice, but the service was particularly great this evening. Thank you! Great variety of vegetarian fare. The food is amazing but the service is so hit or miss. I've been here several times with large parties to just myself and my husband. This past weekend we had a reservation but were sat outside. It took 10 minutes to even see our waiter. By time he came, he asked if we wanted any alcoholic beverages and my friend said "good question" and our waiter turned and walked away!! Never mind the fact the rest of us knew what we wanted and I had a question. It was another 15 mins before we saw him again. Then my husband ordered a coke and our other friends boh came out 10 mins before his coke did. It was one of the only times I've tipped less than 10% and I wanted to give all of our tip to the host as he was great about coming around to top off waters and ask how our food was. Whenever we're in Baltimore, Sticky Rice is our must stop. It's a hipster hangout, but don't take that the wrong way...it's great food and the bar offerings are great too. Sticky Rice is a great, casual place with quite the menu. I was impressed by the vegetarian and vegan options they offer- the Vegan Delight Miso Bowl was more than enough for the price. This was my second time at the restaurant and I will definitely be back for more.